In a continuing and rather ineffective effort to illuminate the issues with regard to the LRT expansion into the river valley, I’ve attended ‘information sessions’, yapped my mouth off to anyone who will listen, blogged endlessly about the beauty of the river valley, and written letters to local newspapers (cc’d to city councillors.) Here is my latest love letter to Louise McKinney Park, the Cloverdale Pedestrian Bridge, and the parts of the river valley that will be affected by the construction. The thing is, I have to say something. What’s coming down the track, literally, is a catastrophe for this part of the river valley. 1. A massive, ugly hole through the eastern edge of Louise McKinney Park. If you don’t believe this, check out the entrance on the side of the hill near the University, and on the other side, below Ezio Faraone Park. 2. The destruction of three bridges: the Cloverdale PEDESTRIAN bridge, the bridge over 98 Avenue, and the bridge that crosses Connor’s Hill road. In particular, the Cloverdale Pedestrian Bridge is surely one of the nicest, if not the nicest bridge in Edmonton, affording a unparalleled view of the river valley, a promenade-like setting for outdoor enthusiasts, acoustic perfection for a certain wandering BLUES PLAYER, a connecting point to other destinations in the river valley for the hundreds if not thousands of folks who use (walk, run, cycle) the area on a DAILY basis, an unobstructed view of the Dragonboat races, the Sourdough raft races, and many other events that take place on or near the river, and up until the LRT expansion cuts through the park(s), a quiet, lovely and contemplative walkway, connecting two green spaces and located just minutes from downtown. Oh, one more thing, geese nest on this bridge each spring, but who cares about them? 3. 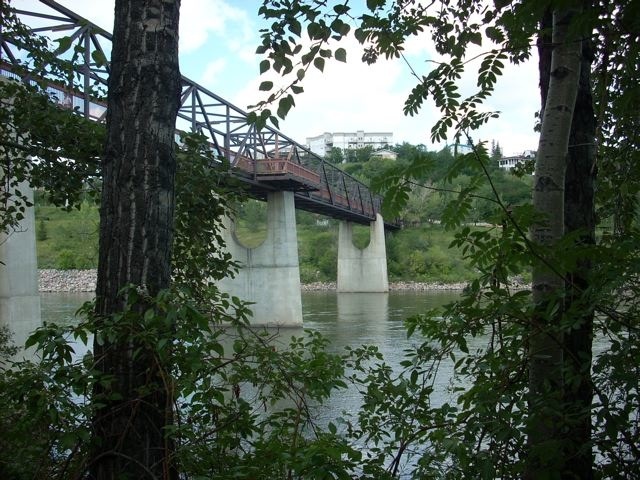 Construction, displacement, industrialization, and noise in three park areas: Louise McKinney Park, Henrietta Muir Park on the south side of the North Saskatchewan River, which also has several connecting paths to the river valley trail system, and the Muttart. I don’t know if the Muttart folks are on board with this, but the green space that the LRT expansion will be appropriating would necessarily be quite large, cutting through a trail, the Horticultural Society flower beds, and a big chunk of the hill west of the Muttart, which is nothing but green grass, a few trees, and a big open space for flying kites or running dogs. Again, who values this? According to Adam Laughlin, the route will service the Edmonton Folk Music Festival, which it certainly will, but this event is four days long, once a year. What about all of us who use and enjoy this area of the river valley on a daily basis throughout the entire year? 4. The route up Connor’s Hill will take a slice of the hill and destroy or re-configure the pedestrian bridge that crosses over this road, disrupting entry into yet another park, Mill Creek Ravine. The Transportation office is non-committal, and rather disingenuous I think, about the impact on the ski hill, using phrases such as ‘accomodating both uses with some modifications.’ I don’t see a lot of available space at the top of the hill, which suggests the ‘accomodating’ will be on the hill side, not along the road. Oh well, there’s always Snow Valley. Initially, those who actually use, and love the river valley, this ‘gem of the city’, will be the people most impacted by this section of the southeast expansion of the LRT. Of course, this does not include the non-measurable impact, such as the aesthetics of the park areas and trail system, and the impact on local wildlife. However, we all will pay for this decision, as the things that we collectively value about this city are slowly eaten away by the values of a few. Something to keep in mind as we head to the polls in October. River valley walker, blogger, and LRT user.